Click here to change the amount to any amount you would like to donate, and you don't want any reward. Here is a project update with opening sequence storyboard and broadstroke overview. THC Update - Opening Sequence and Pilot interviews from KreyTor on Vimeo. Whether you have heard of Basic Income or not, this independent film project will tell you an important story about Basic Income and the various experiments (including the late 60s U.S. experiments, the Canadian Mincome experiment, and current Ontario pilot and other pilots and experiments). This documentary weave the tale of human survival, progress and setbacks from our early days to modern days with a glance into the possibilities for our future. A look at history of early communal economy, modern economy and a possible future under basic income. Volunteers to help in animation and various media assets is also welcome. This is an open movie project that will eventually be widely distributed online for free. Profit and commercialization is not the focus of this project and any contributions will be used to cover cost of production, post-production and raising awareness. Originally produced assets (Blender or 3D animated models, digital arts, soundtracks, sound effects, other medias) with artist or creator's consent will be made available (upon official wide public release on the internet). This will allow educational institutions and other independent artist to use them for their projects. Here is our initial pitch video from the launch of our first crowdfunding campaign. 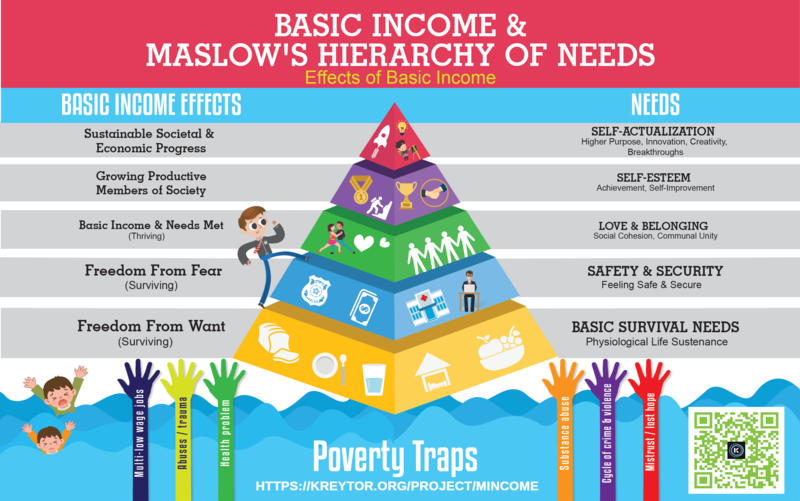 Our project dusts off the records to review some of the basic income studies worldwide including the Canadian Mincome experiment in the province of Manitoba. We revisit the results with experts who have gone back to review the 1970s data from the completed experiments. Mincome is the term used for a Canadian Basic Income experiment in the 1970s where everyone in the town of Dauphin, Manitoba was guaranteed an annual income. The experiment was backed by different levels of government. So what happened to it and why haven’t you heard about it? The documentary takes the viewer on a journey into the history of human's survival. Stories of basic income experiments past and present, including the Canadian 1970s Mincome experiment, diving deep into the results and why the project was eventually abandoned. Drawing from the Manitoba example to worldwide case studies, the documentary also covers the principles of basic income from ancient to modern times, discussing the different perspectives on the costs and savings associated with various types of Basic Income. Dr. Martin Luther King Jr's 50th Anniversary Tribute, Plus Nixon's Family Assistance Plan (Basic Income / Guaranteed Income) from KreyTor on Vimeo. We thank all who have contributed to the initial crowdfunding campaign. The perks you selected still applies and were transferred over. Those who had pledged in the original crowdfunding campaign but have not transferred the funds yet can just take part again in this round. Aside from funds we need creative artist in various areas with expected high demand on animation (Blender or other tools). All assets created for this open (documentary) movie, and with contributing artist consent, will be made available under open license once the film festival and movie theatre run / cycle are completed. The more funds and volunteer we get, the more engrossing and captivating a film it will be. In the process we will create assets and educational materials that can be reused by the public, including educational institutions for teaching not only basic income but also about human history. Some of the best documentary are acclaimed for their visuals first, and content or topic second. To produce the captivating visuals for the storyline, while making a case for the topic of a documentary, would normally cost hundreds of thousands. We are confident we can do an entertaining piece. But the more funds and volunteers we get the more we can push the envelope to get the acclamation that will draw large audiences to watch the documentary. Kreytor.org or "Creator's Node" was created by us as a platform to crowdfund a project at very low cost, especially for Canadians. Kreytor.org was established on July 1, 2012 and have under went continuous development and improvement. This platform will also be used to share media assets that are originally created for our open source film projects. Stock footage and soundtracks produced during production will be made available if possible as we build a database of stock footage, sounds, and images. The goal is to share these creative works as quality stock archives that filmmakers could use. Any profit or payment for commercial use going directly to the artist, cutting out the middleman and their percentage commission or service fees. The footage and sounds or images produced for "The Human Condition: Survival" will be shared as stock archive if possible. Ultimately it will depend on the artist we work with or whose work we licensed from. The artist reserves the right to decide how their work are distributed and shared, and will have the final say. For the soundtrack used in this crowdfunding promo video, this was a collaboration between the director and Paul Cecchetti of www.paulcecchettimusic.com and we are making this music available under open license. We have been working on this documentary for several years now and conducted our first interview and fact finding on 2013. We are advancing the production with an aim to accelerate its completion. Most of the interviews are done but more footage and post-production works needs to be done. Your help will allow us to complete this project sooner rather than later. * Infographic concept to be turned to animated infographic for the documentary.